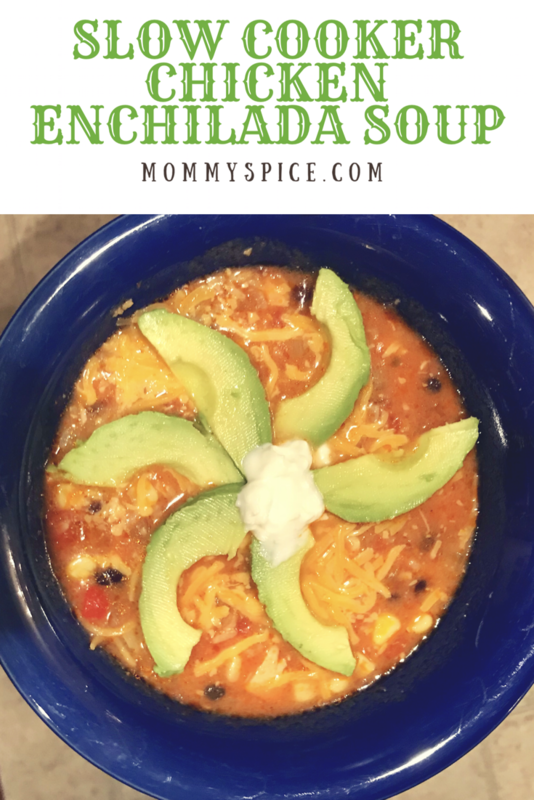 This slower cooker version of chicken enchilada soup has been consistent in our dinner rotation for years now. It wasn’t until one day recently when a forgotten ingredient made me branch out and create a stove top version. However, on a busy day you cannot beat the slow cooker. Not to mention how delicious it makes the entire house smell! There is just something about walking in the door to the aroma of a home cooked meal, it really washes the stresses of the day away! Dump and go! No really!! Besides chopping up the onion and pepper this could not be easier. I usually like to first put in the canned ingredients, tomatoes, beans and enchilada sauce. Top that with corn, onion and pepper. Next add in your liquid, milk and broth. Top everything with your chicken and you’re good to go. Set your slow cooker for high 3 hours, or low 6 hours. When time is up, shred your chicken and give everything a good stir. Put your slow cooker on keep warm. Lastly I like to add in one tablespoon of diced up butter to just give it a nice velvety finish. While the butter melts into the soup get any additional add on ingredients ready to go. Then eat up and enjoy! This is kid approved in my house and such a nice way to sneak in extra veggies. My tip for this is if you do want to add rice to the soup get one of those 90 second steam bags. Then about a half an hour before cook time is up, I just dump the entire bag in without even steaming it. The rice will finish cooking in the soup in the slow cooker and will have more flavor! Also do not skip the toppings! It’s the best part, piling on all the toppings of your choice and really making the soup your own. My kids especially like this, everyone’s bowl is different and it makes them feel more involved in the choices for their dinner.